I have a friend Gail just like Oprah has a friend Gayle. Their names are spelled differently, but they are the same kind of friends. Stuff we might not know about life and getting older. I had never even heard of alligator skin. I had never even thought of my skin EVER resembling an alligator’s. Later that day, my eyes caught a pattern on the side of my calf. Something I hadn’t noticed before. Gail says lotion helps some, but it doesn’t make the alligator skin disappear. Mine seems here to stay. So I guess it’s time to embrace my patches of alligator skin. Or perhaps it’s crocodile skin. 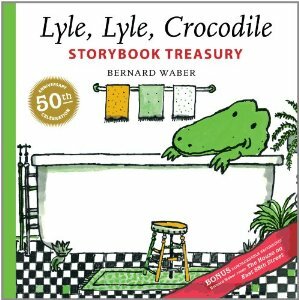 Bernard Waber, author of the wonderful picture books about Lyle the Crocodile, died on May 16. 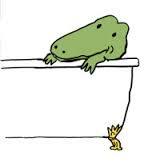 Lyle is one of the great characters of children’s literature. He’s not the type to sit around and grump. He tackles life with gusto. Even when the chips are down, you seldom see him frown. And he seems quite content in his crocodile skin. I’m going to work hard to be content, too. After all, alligator/crocodile skin makes us all a bit more like lovable Lyle. 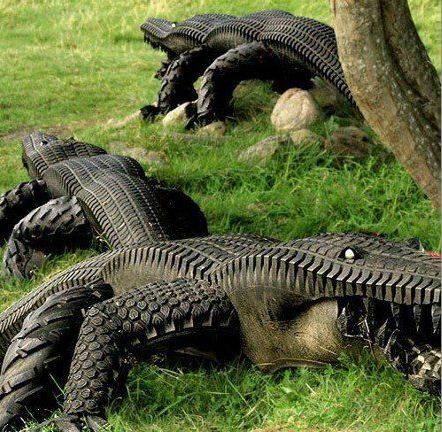 Top Photo: These charming alligators were created from recycled tires,which I found on the site Reclaim, Grow, Sustain: Leaning to Live a Life Sustainable.